Willis Winter Bradley, a Representative from California was born in Ransomville, Niagara County, N.Y. on June 28, 1884. He moved with his parents to Milnor, N.Dak., in July 1884 and to Forman, N.Dak., in 1891. He attended the public schools, and Hamlin University, St. Paul, Minnesota. 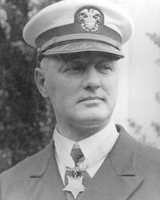 He was deputy registrant of deeds of Sargent County, N.Dak., in 1902 and 1903. he was then graduated from the United States Naval Academy in 1906. During the First World War, He served as gunnery officer and as chief of the Explosives Section, Bureau of Ordnance, Navy Department. He was awarded the Congressional Medal of Honor. Bradley was the Governor of Guam from 1929-1931 and captain of the Pearl Harbor Navy Yard 1933-1935. He attached to the Board of Inspection and Survey, Pacific Coast Section, from 1940-1946. In 1946 retired from the United States Navy because of physical incapacity incurred in line of duty, and took up residence in Long Beach, Calif., in 1931. He was elected as a Republican to the Eightieth Congress (January 3, 1947-January 3, 1949), but was an unsuccessful candidate for reelection in 1948 to the Eighty-first Congress. He was assistant to the president of the Pacific Coast Steamship Co. from 1949-1952. Bradley was a member of the State assembly from 1952 until his death in Santa Barbara, Calif. on August 27, 1954; interment in Fort Rosecrans National Cemetery, San Diego, Calif.